Because we want robots to be interactive we also have designed a graphical screen device : the POB-LCD128. 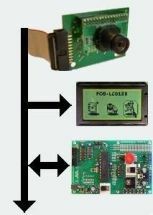 Build your own Graphical User Interface, print in real time the camera's view, the POB-LCD128 allows you to interact with your bot. 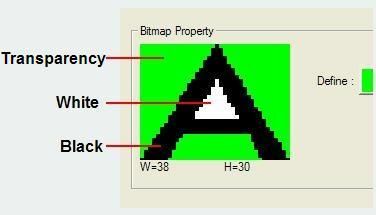 The POB-Eye's Software Development Kit allows to draw a picture and to generate a graphical resources library. You just have to call the DrawBitmap function to draw on the POB-LCD128. The POB-Eye graphical library can manage color transparencies and pictures superposition. So, you can manage the same display that a PDA can do.